Waking up to the delightful sound of my alarm while simultaneously being kicked in the face by a uncontrolled limb in a Next jumpsuit, I knew that today would be a good one. First of all, it was going to be 26 degrees in sunny Yorkshire and secondly it was our Sports Day at school. The Other Half was up and at ’em also as it was his Sports’ Day and with him being a PE Teacher, it was his day to shine. And shine he did, like a beacon in the sea, as he forgot to apply sun cream to his, by his own admission, rather sizeable nose. Once upon a time, many moons ago, The Other Half and I used to work together in the same school. Similar to epic romance stories like Romeo and Juliet, The Notebook and Lady and the Tramp, ours was a tale of true love and passion whereby we met in a drunken stupor on a Christmas night out. He asked me out, I said yes, he tried to dump me a few weeks later, I clung on for dear life and eight years and two kids later we are bound together by our huge mortgage and living in an unmarried bliss of broken sleep, dirty nappies and Sky Plus. However, this PE connection served me well in past Sports’ Days because I was invited into the ‘circle of trust’ and allowed to do the PE type jobs such as rake the sand in the long jump or pick up javelins rather than just being told to do ‘crowd control’ which usually involved teachers hovering around pungent Year 9s begging them to cheer on their team mates running in the relay and ordering and them to pick up their litter or even trying to prevent them from climbing over the wall to go to McDonalds across the road. However, not until I moved to my current school, did I realise that my old school was missing a trick when it came to Sports’ Day because only one word can sum up it up and that word is: epic. Epic. A small word with such a big meaning, but it really was an epic day. I recall, after lunch, standing and watching a bunch of pre-pubescent Smurfs having a Tug of War against a form of blood thirsty zombies and thinking that this wouldn’t happen in any other job in the world. Some of the costumes at this year’s Sports’ Day. Please note that these are not actual students. As a qualified netball umpire (I am well aware of the coolness that just oozes from my pores), I was asked to umpire Year 7 netball in the morning. I jumped at the chance because not only do I love netball, but students might mistake me for one of the cool PE Teachers as opposed to the geeky English Teacher who gets a bit too excited at modelling PEE paragraphs. Also, and more importantly, I was able to wear my trusty jogging bottoms. You know the ones I mean, the ones I have just about worn every day for the last six months of my maternity leave. Today they were totally relevant to what I was doing and not just being used to lounge around the house in all day doing the exact opposite of what ‘jogging’ bottoms are supposed to do. Anyway, the netball games began and the teams were mixed boy and girl; I have to admit that between my screeching of ‘keep your feet still’, ‘just shoot it’ and ‘no you can’t tackle her’, the boys were pretty awesome at the game and put some of the girls to shame. In addition to my refereeing like a non-bias professional, I managed to play my ‘mum card’ as I made a student take his thick black jumper off amidst fears that he may over heat and dehydrate, I fastened another boy’s laces and it was safe to say that if any of them had returned to the netball courts after break with a bit of leftover ice-cream on their chops, then my super stain remover ‘mum spit’ may have had to make an appearance. 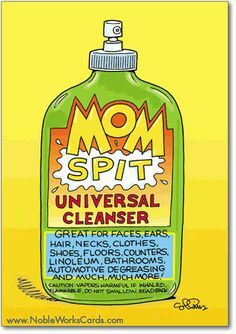 I am sure the British equivalent ‘Mum Spit’ works just as well. After lunch, students returned to their forms to change into their chosen form theme. Both students and teachers dress up in full costume and make-up and they look fantastic. This year we had zombies, cheerleaders, Smurfs, surgeons, the Toy Story Aliens, vampires, Pink Ladies and T-Birds to name but a few. I was even asked to help put red contact lenses directly into the eyes of some Year 9 vampires. (Now there’s a sentence I never thought I would ever write.) In the afternoon, the students raced against each other in relays and then tested their strength in a Tug of War. 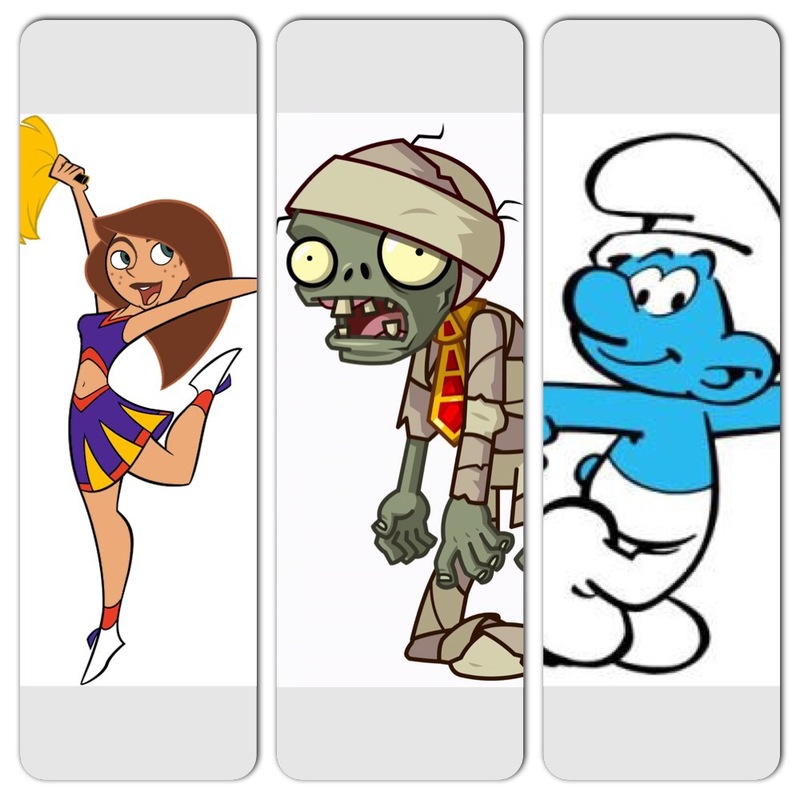 All bets were off in the events too as the zombies kicked the aliens’ asses in the running events and yet were annilatied by a bunch of cheerleaders in the Tug of War. As the day drew to a close, the fantastic PE staff announced the Year 7, 8 and 9 winners and the students left school with painted faces, sun drunk and happy which also meant that I too could leave to prepare for a rare night out with my friends which involved me painting on my ‘going out’ face, getting some drunk and I don’t know about being happy, but I was certainly more merry than I had been in well over a year. To celebrate an amalgamation of June and July birthdays, my friend booked a Groupon at Kingsley Dog racing where we drunk a little too much, bet too little, ate questionable meat and where my friend, JC, took a few too many selfies with my phone. 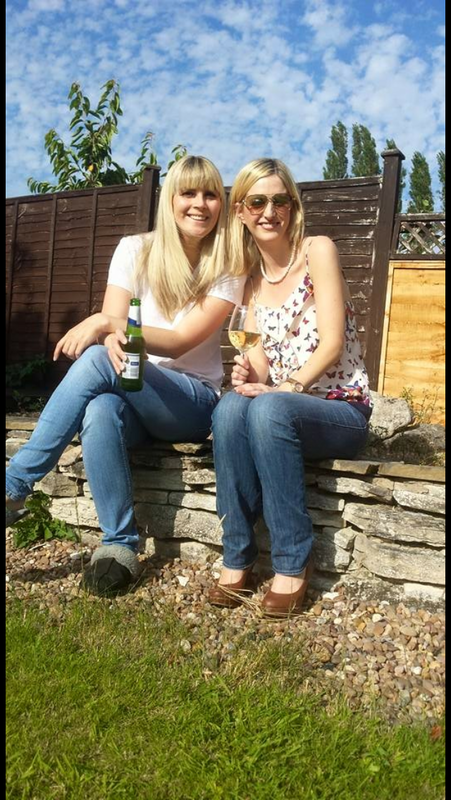 Me lovely glamorous friend and me in slippers…with a beer. The evening began rather civilised with a few drinks in my garden. The Other Half, perhaps inspired by some Year 9s trying to escape to McDonalds at his Sports Day, took the girl for a ‘drive thru’ at the local ‘Golden Arches’ and that left the boy with me and my friends in the garden. Trying to be the hostess with the mostess, I offered one friend a glass of white wine which, she pointed out, had floaty bits in it, perhaps my ‘mum spit’ got an outing that day after all… (It didn’t CG, don’t worry.) Our taxi arrived and we descended upon The Dogs. Despite a few reservations about the Groupon deal, a lovely evening was had by all. We were able to sit outside in the pleasant evening, enjoy a drink and have a laugh. 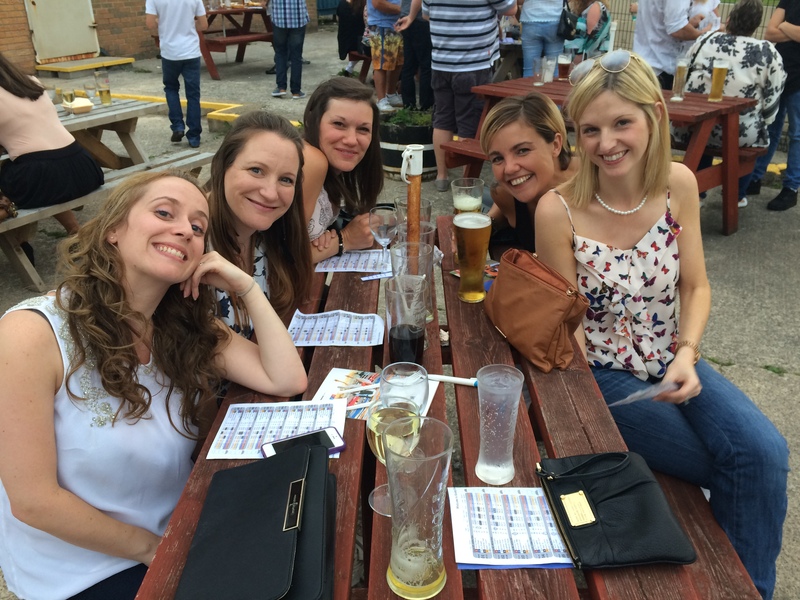 Now that we all have children, it’s not often that we get a childless night out together. Just to serve as a reminder that I had left my ‘mum hat’ (and spit) at home, The Other Half text me at half past nine to tell me that the Ninja Flippin’ Dude had been crying and looking around for me for the past two hours. In order to keep my guilt at bay, I ordered a gin and tonic and after fifteen minutes, I received another text informing me that he was finally asleep, but on our bed. The girls and my gin and tonic. And that is right where he is this very moment as I am typing these last few words. I know that I am very slow at typing these posts and I am writing about the events that happened last Friday. I almost wish I could say that it was a weekend long hangover that prevented me from typing, but sadly no. It has been my Little Dude. He just won’t settle in his cot at the moment. Therefore, I had better stop typing this in the dark, turn off the computer, give him a cuddle and go to sleep with him. Hilarious post had me chuckling throughout! I’m glad you had a lovely evening out, I am very jealous! So funny! What a busy day you had! Thank you so much for linking with #TwinklyTuesday.